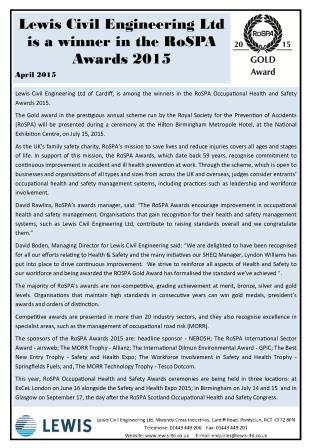 Gold Safety Award for the 4th Year! 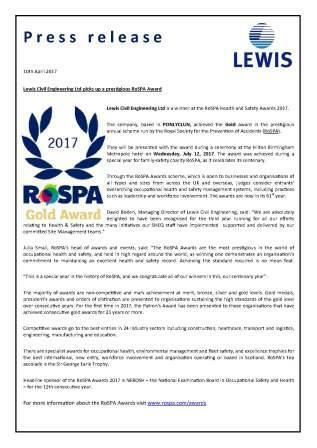 Lewis Civil Engineering Ltd is a winner at the RoSPA Health and Safety Awards 2017. The company, based in PONLYCLUN, achieved the Gold award in the prestigious annual scheme run by the Royal Society for the Prevention of Accidents (RoSPA). 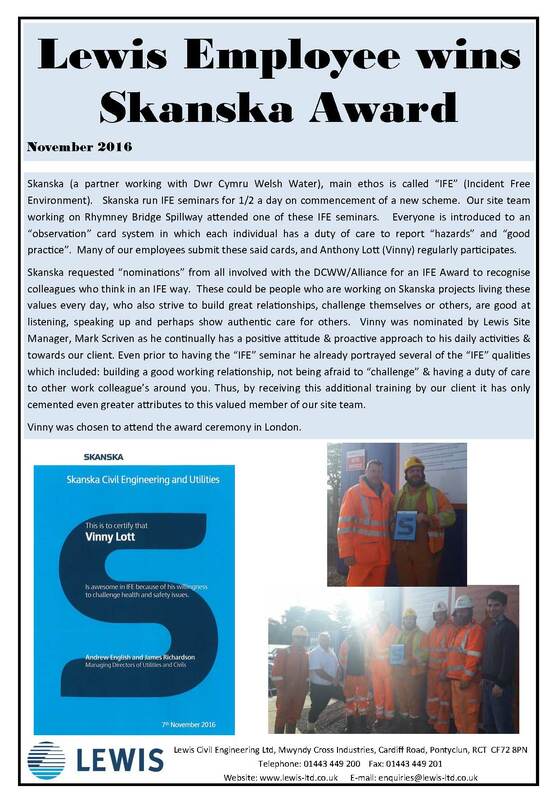 Skanska (a partner working with Dwr Cymru Welsh Water), main ethos is called “IFE” (Incident Free Environment). Skanska run IFE seminars for 1/2 a day on commencement of a new scheme. Our site team working on Rhymney Bridge Spillway attended one of these IFE seminars. Everyone is introduced to an “observation” card system in which each individual has a duty of care to report “hazards” and “good practice”. Many of our employees submit these said cards, and Anthony Lott (Vinny) regularly participates. 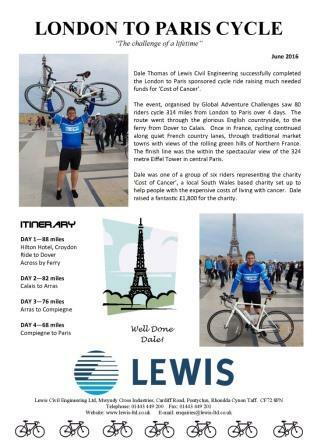 Dale Thomas of Lewis Civil Engineering successfully completed the London to Paris sponsored cycle ride raising much needed funds for ‘Cost of Cancer’. 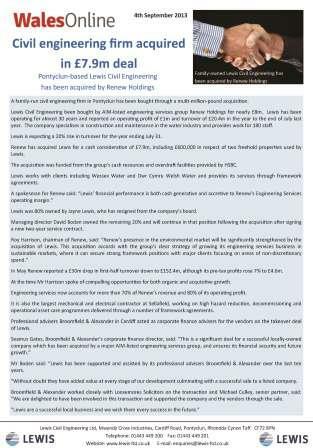 The Lewis parent company Renew Holdings, this morning announced the Group reported record interim results for the half year to 31 March 2016 with further growth in both revenue and operating profit. 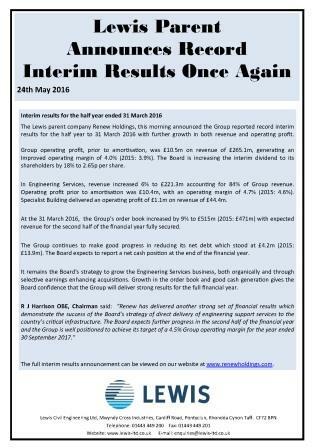 Group operating profit, prior to amortisation, was £10.5m on revenue of £265.1m, generating an Improved operating margin of 4.0% (2015: 3.9%). The Board is increasing the interim dividend to its shareholders by 18% to 2.65p per share. 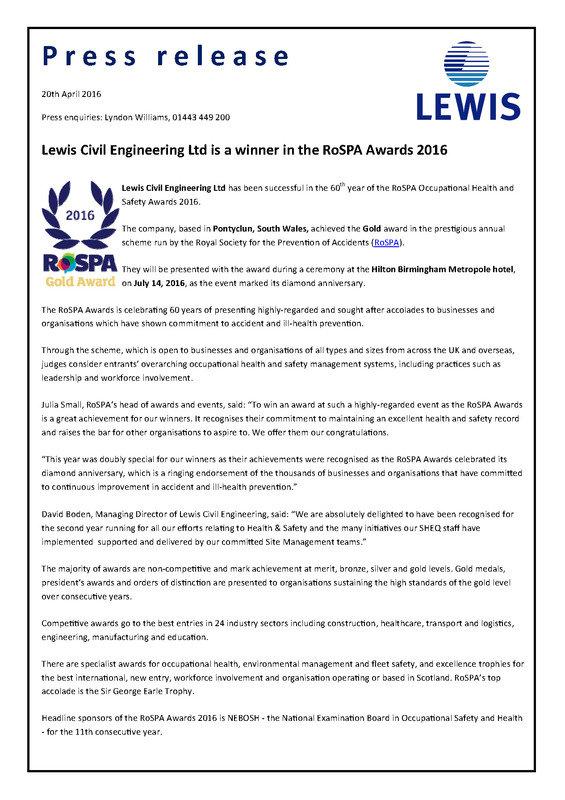 Lewis Civil Engineering Ltd has been successful in the 60th year of the RoSPA Occupational Health and Safety Awards 2016. 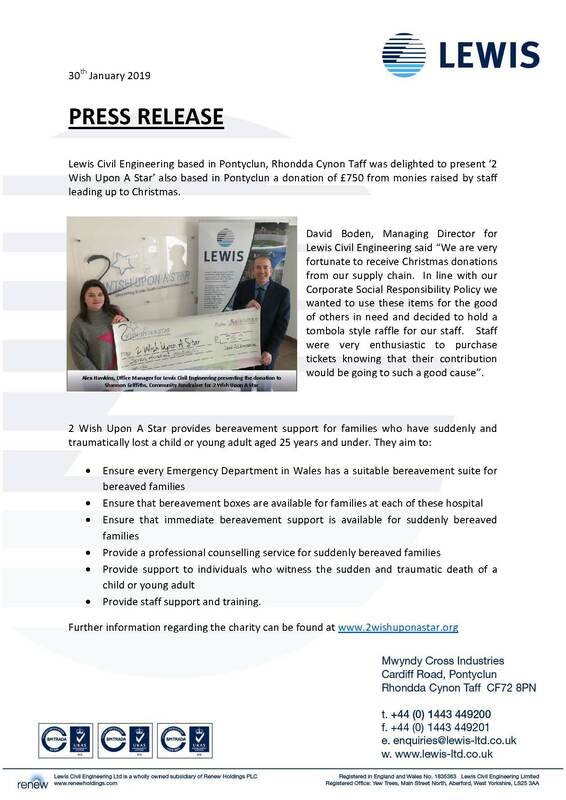 The company, based in Pontyclun, South Wales, achieved the Gold award in the prestigious annual scheme run by the Royal Society for the Prevention of Accidents (RoSPA). Lewis Civil Engineering was proud to be the main event sponsor for a great Gatsby themed Race Night in support of WaterAid, a bi annual event hosted by Wessex, Bristol and Bournemouth Water. 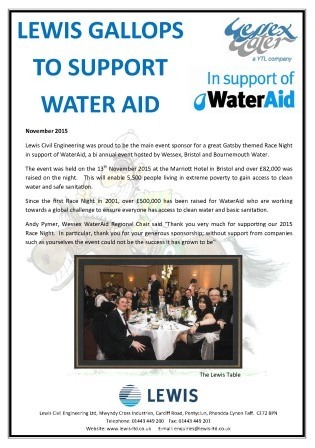 The event was held on the 13th November 2015 at the Marriott Hotel in Bristol and over £82,000 was raised on the night. This will enable 5,500 people living in extreme poverty to gain access to clean water and safe sanitation. 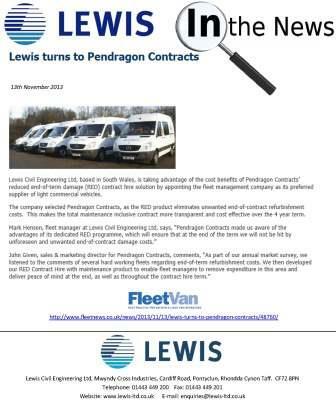 The Fleet Operator Recognition Scheme (FORS) is a voluntary scheme for fleet operators. Its purpose is to raise the level of quality within fleet operations, and to demonstrate which operators are achieving the standards. Bright and early on the morning of 25th September the Lewis Dream Team set off to participate in a charity cycle challenge in aid of Mencap. 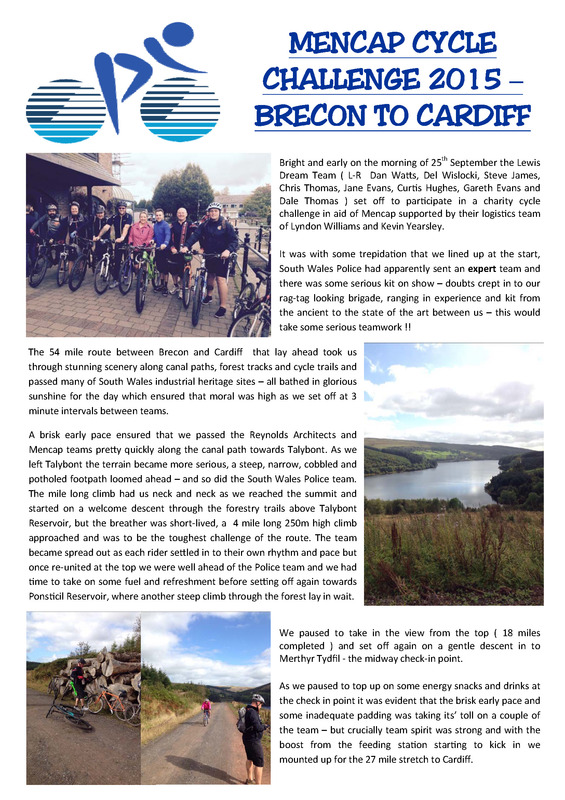 The 54 mile route between Brecon and Cardiff took them through stunning scenery along canal paths, forest tracks and cycle trails and passed many of South Wales industrial heritage sites. The event raised over £5000 for Mencap. 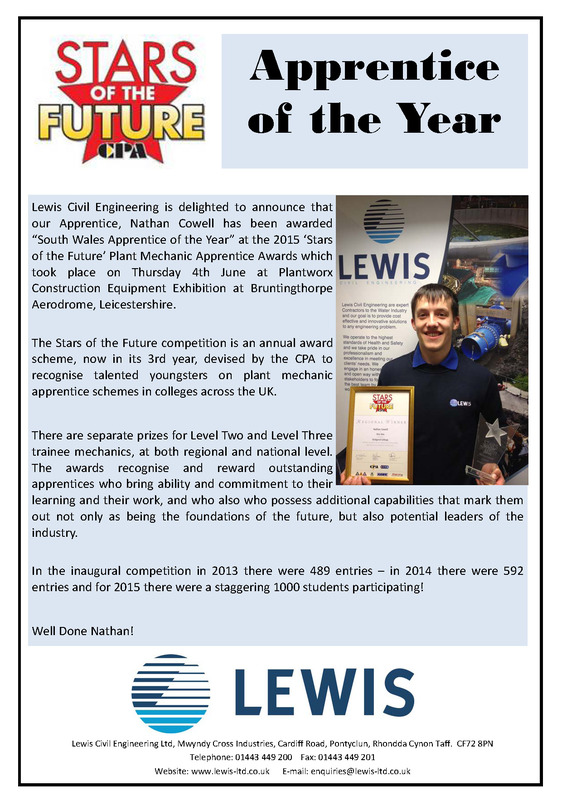 Lewis Civil Engineering is delighted to announce that our Apprentice, Nathan Cowell has been awarded “South Wales Apprentice of the Year” at the 2015 ‘Stars of the Future’ Plant Mechanic Apprentice Awards which took place on Thursday 4th June at Plantworx Construction Equipment Exhibition at Bruntingthorpe Aerodrome, Leicestershire. 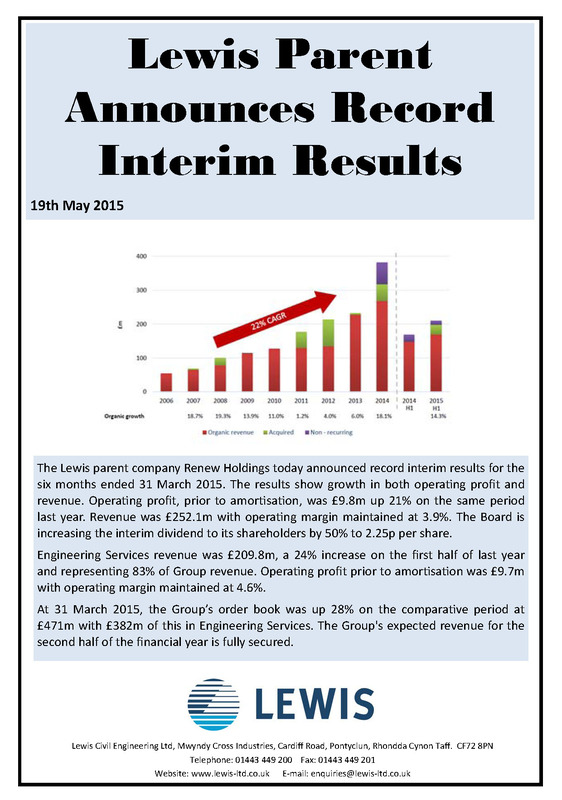 The Lewis parent company Renew Holdings today announced record interim results for the six months ended 31 March 2015. The results show growth in both operating profit and revenue. 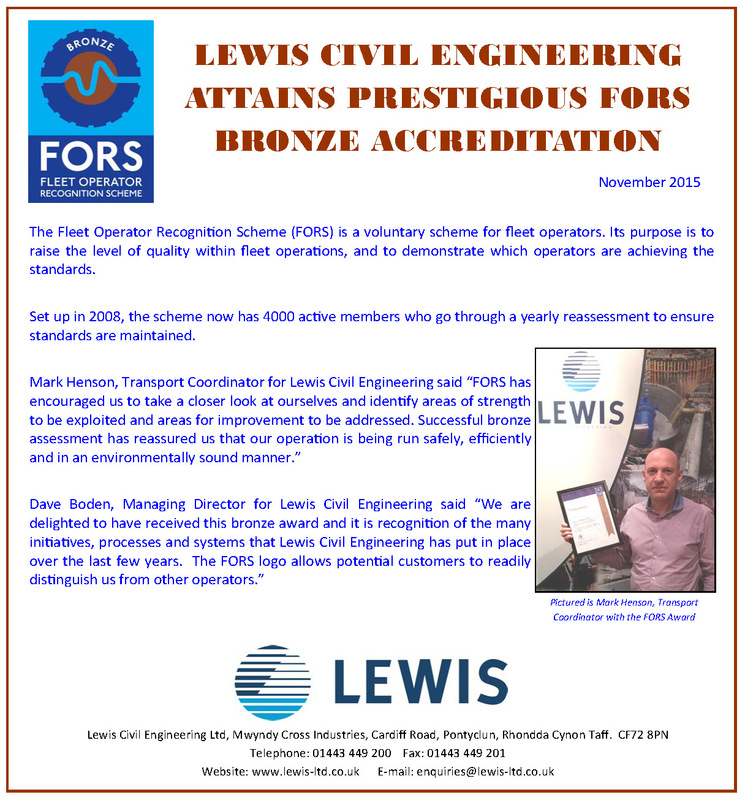 Lewis Civil Engineering Ltd of Cardiff, is among the winners in the RoSPA Occupational Health and Safety Awards 2015. 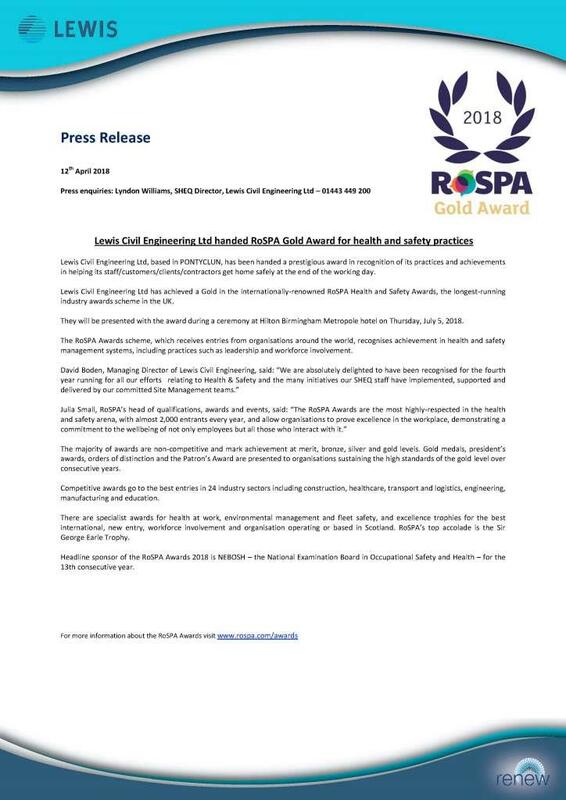 The Gold award in the prestigious annual scheme run by the Royal Society for the Prevention of Accidents (RoSPA) will be presented during a ceremony at the Hilton Birmingham Metropole Hotel, at the National Exhibition Centre, on July 15, 2015. 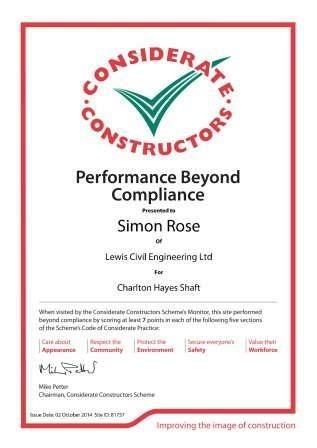 We are delighted to have been awarded with the Considerate Contractors Performance Beyond Compliance mark for our work on the Charlton Hayes Shaft. 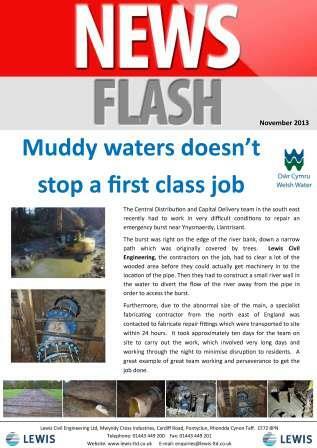 This award recognises our efforts in caring about the appearance of the site, respecting the community, protecting the environment, securing everyone's safety and valuing the workforce. 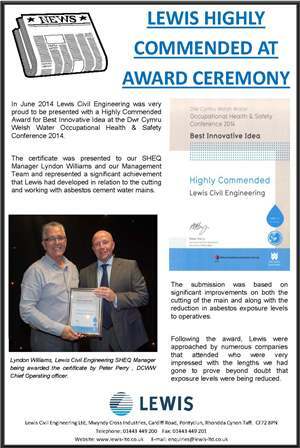 In June 2014 Lewis Civil Engineering was very proud to be presented with a Highly Commended Award for Best Innovative Idea at the Dwr Cymru Welsh Water Occupational Health & Safety Conference 2014. The certificate was presented to our SHEQ Manager Lyndon Williams and our Management Team and represented a significant achievement that Lewis had developed in relation to the cutting and working with asbestos cement water mains. 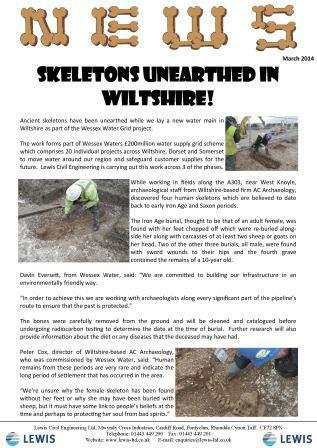 Ancient skeletons have been unearthed while we lay a new water main in Wiltshire as part of the Wessex Water Grid project. Successfully completed an emergency burst near Ynysmaerdy, Llantrisant in extremely difficult conditions on the edge of the river bank. 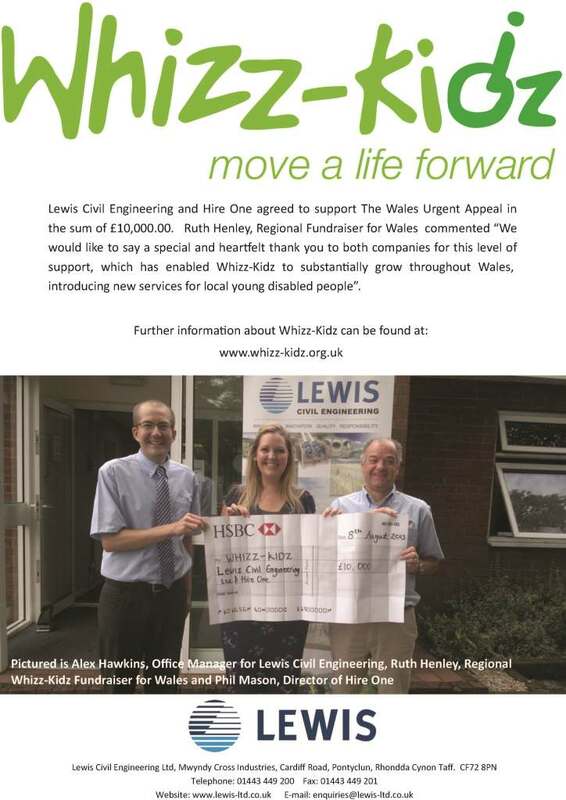 Lewis Civil Engineering and Hire One agreed to support The Wales Urgent Appeal in the sum of £10,000.00. 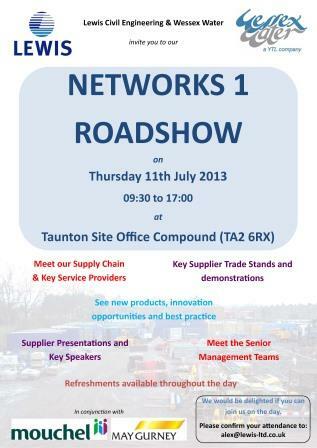 Final details of our Roadshow have now been announced.